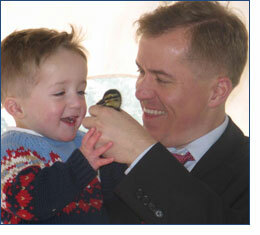 Governor Matt Blunt was born in Greene County and spent his early years in the town of Strafford, near Springfield. He learned at a young age the values of faith, family, and hard work. He attended Missouri public schools and the United States Naval Academy in Annapolis, Maryland. Matt Blunt is a sixth generation Missourian. Prior to his election as Governor, Blunt served as Missouri's 37th Secretary of State (2001-2005). As Secretary of State, he led the successful effort to modernize state election law and introduced new technology to the office's operations, enabling businesses and others to file necessary documents and find information conveniently and at much-reduced cost for customers and taxpayers. Before Missourians elected him Secretary of State, Blunt represented the 139th Legislative District of northern Greene County in the Missouri House of Representatives (1999-2001), and worked in private business. 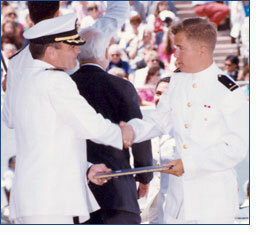 Upon his graduation from the United States Naval Academy in 1993, he began a naval career that spanned 14 years, including more than five years on active duty. Governor Blunt served in Operation Support Democracy, which involved the United Nations blockade of Haiti. He also participated in the interdiction of illegal Cuban immigrants and drug interdiction missions off the coast of South America. 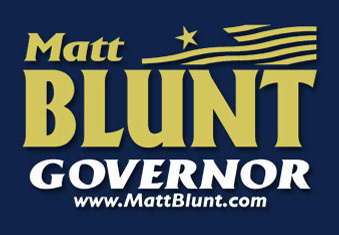 Blunt was awarded several military commendations, including four Navy and Marine Corps Achievement medals and the Humanitarian Service Medal. On October 9, 2001, Matt Blunt became the first statewide elected official in the history of Missouri to be called into active military duty. He served for six months in support of Operation Enduring Freedom, the nation's military response to the terrorist attacks of September 11, 2001. He was promoted to the rank of Lieutenant Commander in the United States Naval Reserve subsequent to his return to the United States. The people of Missouri elected Matt Blunt their 54th Governor on November 2, 2004. Blunt carried 101 of the state's 114 counties. He campaigned on a platform pledging to make education the state's top budget priority; create new family-supporting jobs by strengthening Missouri's economy and entrepreneurial climate; expand access to high-quality, affordable health care; and help family budgets, farms, and small businesses by holding the line on job-killing tax increases. The Governor followed through on each promise, providing effective leadership for some of the most successful and productive legislative sessions in many years. Governor Blunt inherited a $1.1 billion dollar budget deficit when he took office, but through responsible fiscal management and planning, he balanced Missouri's budget and produced three surpluses in a row. In his four budgets, Governor Blunt increased education funding at all levels by $1.2 billion with no new taxes on working families. Blunt's budgets put children, schools, and taxpayers first. Before Governor Blunt was elected, Missourians had lost more than 34,000 jobs during the previous four years. He enacted real lawsuit and workers' compensation reforms in his first months, created the Missouri Quality Jobs Act and launched the DREAM Initiative, to promote the revitalization of Missouri communities. Governor Blunt also enacted three major tax cuts. With help from Governor Blunt's pro-growth, pro-jobs initiatives, Missourians created 70,000 new jobs during Blunt's four years as governor. The old, broken Medicaid system, was bankrupting the state when Governor Blunt took office. Working closely with the General Assembly, Governor Blunt replaced the old system with a bi-partisan supported MO HealthNet. The new system focuses on prevention and wellness instead of only sickness and treatment, empowers Missourians to be participants in their own health care decisions, and improves health. Pledging in the campaign and in his Inaugural address to honor and strengthen Missouri's values, Governor Blunt enacted pro-life legislation to protect innocent children; appointed men and women with sound values and strong credentials to the state judiciary; won passage of widely hailed legislation to fight the plague of meth production that endangers our children; and signed bills honoring Missouri's veterans, ensuring that this and future generations will honor the contributions of these men and women to our great state and to America. In leading Missouri in a new and constructive direction, the Governor ended the liberal tax-and-spending policies that wrecked the state budget. Blunt ended the former administration's anti-child policy of cutting aid to schools and stopped the practice of taking dollars from classrooms and putting them into social welfare programs that were growing uncontrollably. With Governor Blunt, Missourians knew they had a Governor who did what he promised, with no new taxes, more for schools, more jobs and economic growth and fiscally responsible state budgets. Since leaving office, Governor Blunt has served as a corporate director and senior advisor to government affairs and financial firms. He has continued his leadership in protecting our Second Amendment rights as an elected member of the National Rifle Association's board of directors. Governor Blunt is a member of the American Legion. Matt and his wife, Melanie, were married in March of 1997. The couple has two sons, William Branch Blunt who was born on March 9, 2005, and Brooks Anderson Blunt, who was born on January 1, 2010. They live in Springfield and attend a Baptist Church near their home.